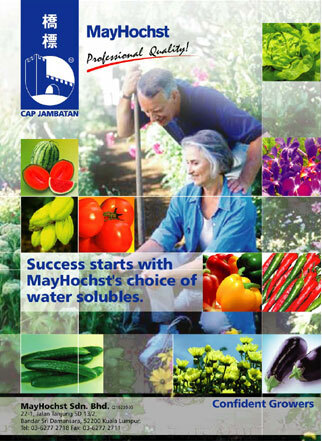 MayHochst Sdn Bhd is a speciality fertiliser company set up to improve yields and quality of horticulture produce in South East Asia. MayHochst is based in Kuala Lumpur and over the past years grown to become a leading speciality company supplying top quality speciality fertilisers to the Malaysian and surrounding market under its Benegro trademark. MayHochst manufactures a wide and distinct range of speciality fertilisers for fertigation and foliar use that comply with European Union (EU) specifications and standards. Our customers consist fertiliser blenders, government departments, an extensive agriculture dealers network, nurseries and large growers. We also export to selected overseas markets predominantly in the South East Asia region. Copyright © 2007 MayHochst. All rights reserved.